If you, members of your family or pets are outside, move slowly and quietly inside. Do not turn your back to the bear, and do not make eye contact. Telephone your neighbours and advise them that a bear is in the area. Sit back and wait. If the bear has no reason to stay, it should soon leave. Please call the Conservation Officer Service to report the bear sighting (1-877-952-7277). THIS DOES NOT MEAN THE BEAR WILL BE SHOT. These reports help us and the Conservation Officers keep track of what bears are up to in Revelstoke’s neighbourhoods. If the bear does not leave within an hour or so, becomes aggressive, or attempts to enter your residence, you should immediately call the Conservation Officer (1-877-952-7277) and RCMP (250-837-5255). Why was the bear in my yard? What attracted it here? See our pages about bear attractants and suggestions for handling them. Remove all attractants. Our Bear Aware Coordinator can help with suggestions and tips. Call 250-837-8624. Ensure there are easy paths of escape for any wild animal that may enter your yard. If you have large areas of unruly bush that may provide cover, consider removing the shrubbery. Bears are fascinating to watch; however, we must ensure they are not rewarded with food when they visit us. A bear who finds food will return, becoming bolder and more curious. 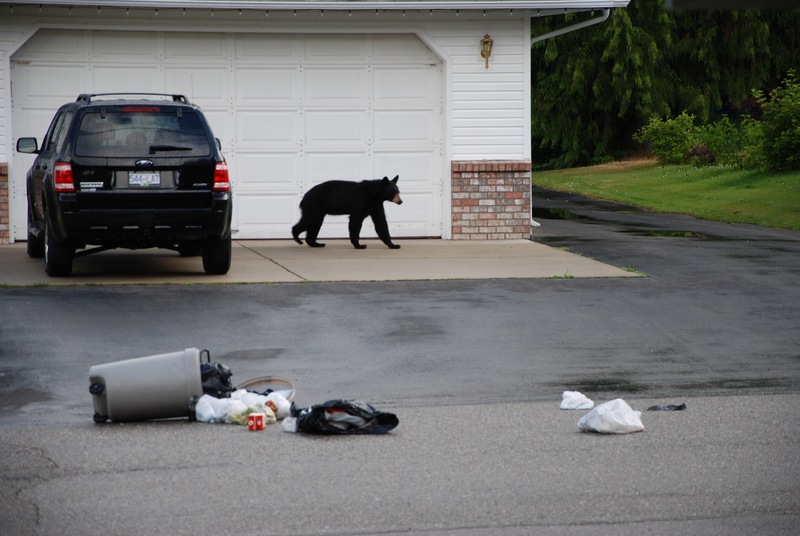 By leaving attractants on your property, you are putting the bears, yourself, your family, and your neighbours at risk. Under the British Columbia Wildlife Act, it is unlawful to provide food to wild animals, either purposely or by neglect. If you do not remove food sources, you may be facing as much as $15,000.00 in fines.